The NCIS team never goes anywhere without a knife! Collected here are a number of knives from different episodes. The blade that from the steak scene at the end of "Flesh and Blood". Also given critical appearances in "Enemies Foreign and Domestic" and "Obesssion". McGee uses the full serrated model to free Kate in Season 1 Episoe 18 "UnSEALed". Tony's knife that from the steak scene at the end of "Flesh and Blood". Ziva saves Ducky using the Cold Steel Kobun as a throwing knife in "Silver War”. The knife returns in S4E5 “Deception” and S4E1 “Shalom” including the knife throwing training in S4E15 “Friends & Lovers”. In the Season 3 Episode 9 "Frame up" Abby is threatend by Chip, her "assistant" when she threatens to expose his frame up of DiNozzo. The Leek is used to defuse a bomb in S3E14 "Light Sleeper". Ziva's new knife from S5e18 "Sea Dogs" and S6E8 "Cloak". 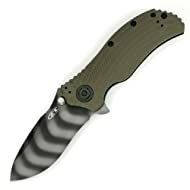 S1E15 "Enigma" Col Ryan uses the spyderco to get out of a tricky situation! Kate's tool of choice from Season 2 Episode 9's "Forced Entry".